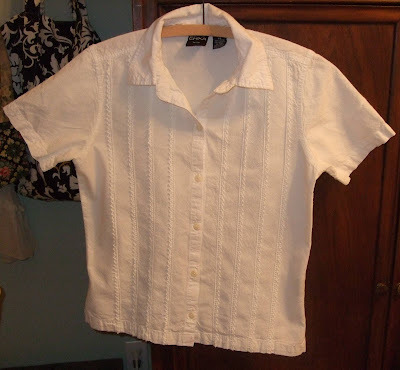 Several months ago, my sweet and clever friend and biz partner, Isabel, posted a tutorial on making easy pillows out of button front shirts. You can see that post here. Last week while out thrifting, I came across this little shirt. White, lace, buttons. Too small for me to wear, but...ah ha! It would make an adorable little pillow and I had recently bought a feather pillow form that would work perfectly. This project was so easy and took less than 30 minutes to complete. If you have been reading my blog for while, you know I love me some easy projects. I am all about the instant gratification. Probably one of the reasons I stopped making quilts. Took too long. I will make quilted pillows which can be completed a lot quicker. 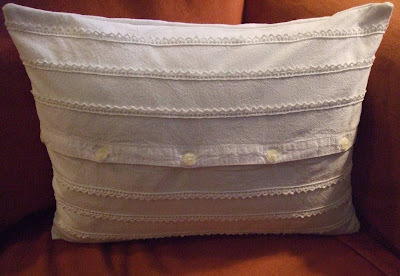 But these shirt pillows take the cake for a cute, and quick project. Now that I made one, I will definitely be on the look out for some more shirts that can be made into pillows. I had hoped to show you pictures of my completed holiday decorating, but unfortunately I'm still not finished. The tree is mostly done, just a few more things to put on. I just noticed that I have reached 100 people who have signed on to follow my blog. Wow! I'm so touched that you all care enough to stop by on a regular basis to see what I've been doing. Thank you so much! I'll be back soon with those holiday pics I keep promising. Until then, I hope you are all having a great week! Well aren't we the creative one? I love it... just way to clever as always. I hope you have an awesome day! Oh my gosh, I LOVE it!! So very pretty! Super cute!!! I wish I could sew.. this makes me want to learn. The pillow turned out soo... cute! That is just the neatest pillow. BRAVO for your easy design! I love that idea for the dress shirt turned pillow. It looks so simple and easy to do. Thanks for the inspiration. Stinkin cute! I might even beable to do that. Perfectly adorable.....I love this idea! Wow, I agree that your project takes the cake! I need to get sewing. I have about 14 pillow forms and all sorts of little blouses and miscellaneous vintage fabrics. Thanks for the inspiration! That is really cute and clever! I will definitely be on the lookout for cute shirts like that on my Goodwill jaunts now! Happy New Year-Favorite Projects of 2009!